So, I’ve spoken… well, written, typed, whatever… before about etiquette involved with the interwebs and more specifically about social media. I’ve even brushed the topic of trolls (Social Media trolling or screaming obscenities from the safety of a fortress). It has become readily apparent to anyone watching even peripherally that social media is 1) not going anywhere, and 2) boiling over with ridiculous amounts of trollery. Yep, trollery. What is trollery, you might ask? Well, I’ll tell you. Most people define the trolling activity as that which trolls, like a ship for fish or crustaceans around in the seas of the internet looking for prey and stirring up the dregs. They lurk in forums, chat rooms, and news feeds looking for heightened emotional content. Whereupon they seize the opportunity to say/type whatever they feel will provoke a larger and more emotional response from the originator of the thread or their adjacent commentators. I imagine them reaching over and grabbing their popcorn and shoveling hands of it in their face while cackling maniacally and watching the show they created with opinions they probably never even held themselves. The other source of trollery is that despicable and rather disgusting creature that makes their abode beneath bridges and accosts poor travelers just trying to make their way across to the other side. While the “innocent” billy goats are generally molested and munched upon like the aforementioned popcorn, the source and cause for this action seems to lack sufficient foundation to justify the hostility. The common theme for both these definitions seems to be that the trolls in question have no real motivation in their interactions and contributions other than hurting people and stirring up their negative emotions by expressing outrageous, hyperbolic, or grossly antithetical opinions and statements to which they, the trolls, rarely adhere in their own philosophy. In other words, they’re just doing it to get a rise out of people. Personally, I have occasionally found the observation of this practice to be entertaining; especially, when one troll happens to be trolled by another troll of equal or surpassing trolliness or snarkiness (This post is going to be full of my own new vocabulary, I think). That always makes for interesting developments and has resulted on rare instances in me being the one reaching for popcorn and cackling maniacally as they rev each other up in an incredibly inane and variably immature arms race of witticisms and false reporting. I’ve often wondered if I set up a side pool when I see these things happening with some of my other observers if we could turn it into a game. Trollery Deathmatch. I sense a reality show. It could happen. Seriously, you’ve seen some of the crap they put out there these days; don’t even tell me that people wouldn’t watch. Now, one of the issues with trolls and their own evolution is that they don’t always ambush passing innocents or wade into the quagmires of other people’s conversations anymore. They post their wildly outrageous (and I do mean in the sense of creating outrage) diatribes and jibes upon their own pages, blogs, and feeds. They fill their metaphorical sewage lines with metric tons of garbage that assaults their followers and, dare I say it, friends, with hyperbole and blatantly polarized inappropriateness. They are frequently rewarded for their behaviors by gaining more followers… or losing friends. To them, this is a game of chicken or a stare-down contest where the hollow victory is declared when they manage to disenfranchise everyone they know. The information gets passed along over and over as truth from on high. The general rule of thumb about seeing information in three or more reputable sources suddenly becomes moot. Nevermind that the origination of the data was not particularly reputable or might just be pure satire. The treeple (or sholls) have witnessed this thought, statement, story, or meme in three places that they trust and thus… it must be fact. Most of the time they have not checked the source at all, the agenda or foundation of said source, or the veracity of the sentiment. It agrees with their own philosophy or agenda and so it is as valid as they are willing to test. They post and re-post continuing to perpetuate the fraud… all the while I can hear the trolls cackling and smell burnt popcorn. I know that in the grand scheme of things it really isn’t a drop in the ocean of what is out there posted, spoken, and written by the alleged safeguards of information (I’m talking about the media-media again). It has become harder and harder to judge what is reputable and what isn’t. News is no longer facts, but more editorializing based on the agenda of which ever viewpoint is financing their current lifestyle. The truth is no longer something you can rely upon from your tv, radio, or press. In fact, I dare say that many of the news icons today are bigger trolls that our usual trolls have ever considered becoming. However, there are still some sources you can trust. 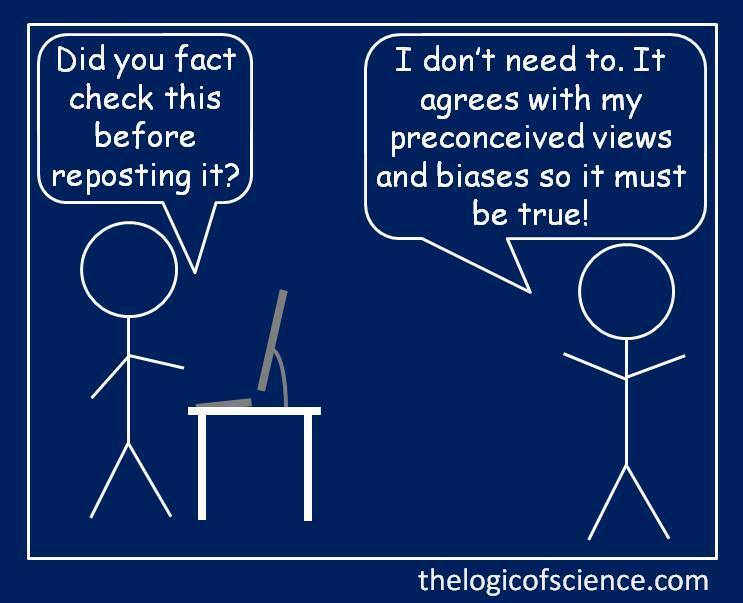 Snopes.com, FactCheck.org, PolitiFact.com, OpenSecrets.org, TruthOrFiction.com, and HoaxSlayer.com are some of the most reputable for checking the verity of your latest meme or repost before you hit “send”. I personally am not going to say that people have to post the facts and only the facts, a joke is still a joke, and satire is still funny and poignant and makes you think… but before you pass something along or respond to the trolls in the world, take a moment to check your own agenda, facts, and purpose and whether it actually is worth your time and energy to contribute to the general nastiness that is the internet.